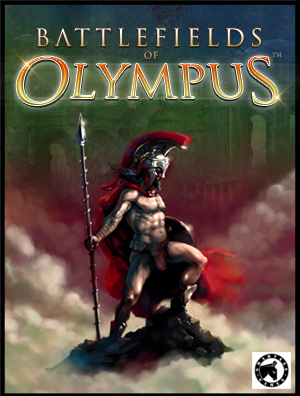 Battlefields of Olympusâ„¢ is a game of struggle, where players with armies at hand, battle over valuable land. The one with the most valuable lands wins favor from the gods. A card game for 2 player, ages 10 and up. Approximate play time: 30 minutes. In the kingdom of immortals, the restless gods decree that mortal man will fight one another to prove their loyalty. By order of Zeus, Ares leaves his throne to inform man of this noble contest. To the victors go the spoils of war and eternal gratitude from the gods. As the general of battle hardened archers, infantry, and other units, you have been commissioned by the high priests to lead your people to victory. When the sisters of fate look favorably upon you, your armies will find strategic advantage on the battlefield. Ambush, flank and surround your opponent's forces in an effort to gain the upper hand. If the battle looks bleak, call on your mercenary forces to turn the tide. Contents: 100 beautifully illustrated cards, rule sheet and quick reference guide. Made in the USA, Battlefields of Olympusâ„¢ comes in a 5.4 x 4 x 1 inch box with top and bottom (not a tuckbox). The two 50 card decks are separated by a divider. Cards are slightly larger than standard playing cards at 3.625 x 2.5 inches. Rule sheet and quick reference guide are in full color.